Transitioning from a crib to a big kid bed is a big milestone in any child’s life. It can be a time of real excitement and a sense of growing up, or it can be a scary and hard change for some kids. And as a parent, it may feel overwhelming trying to determine when is the right time to move your baby into a big kid bed. Here are some tips to make easier the task of transitioning from crib to bed. 1. Make sure you’ve established a bedtime routine first. 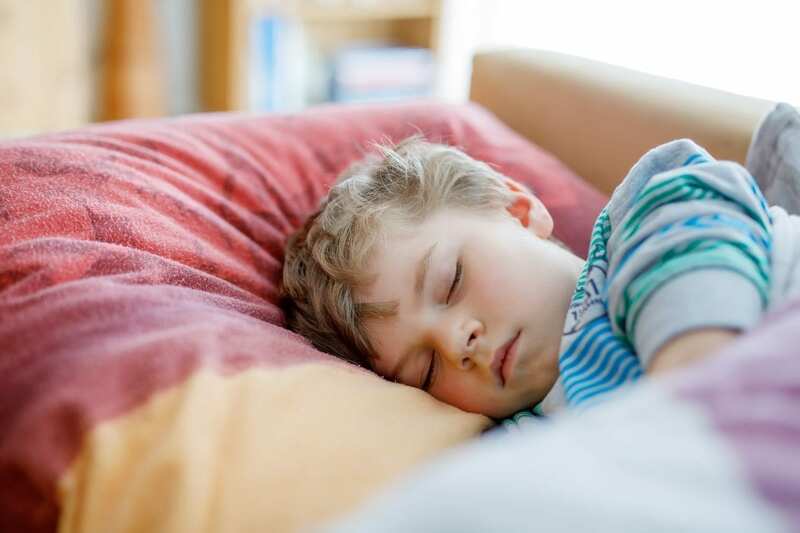 This is key because if you haven’t established a routine, the chances of your child staying in a big kid bed and going to sleep on his or her own is little to none. A few months before you decide to transition your child, start implementing a steadfast routine that you can stick with every night. For instance, in my house our routine looks something like this: take a bath, brush teeth, take vitamins, put on pajamas, quiet play for about half an hour, read one book, sing one song, lights out. The only thing that may change in that routine is whether or not the kids take a bath depending on how lazy I’m feeling (don’t judge!). Other than that, we have stuck to this routine from very early on in each of my children’s lives and it really does help them to go to sleep easily. Having a routine helps tremendously when you’re trying to transition to a big kid bed because moving from crib to bed is, in and of itself, a bit of a traumatic change for some kids. Having a bedtime routine already established and sticking to it through the crib-to-bed transition will help to make the change a little easier for your child to handle. 2. Make it an exciting event. Laying the ground work with your kid about a month in advance will go a long way to helping him or her see this change as an exciting event. Start talking about big kid beds and pointing them out when visiting friends homes or showing him or her pictures from catalogs like Pottery Barn Kids. You can even find books about moving to a big kid bed on Amazon that you can incorporate into your bedtime routine. The more you talk about it and get your child excited about moving into a big kid bed, the easier the transition will be when you make it happen. 3. Start with a mattress on the floor during naps. If you are worried about your child getting the hang of sleeping on a big bed at night, start by “practicing” with a mattress on the floor during naps. This way, you will be awake while he or she is sleeping so you can monitor how he/she is doing. Also, this will help your child get a feel for the new space of the bed (subconsciously creating boundaries and where they end). If your child falls off the mattress while it’s on the floor, it won’t be as jarring as if he/she were already in the bed a few feet off the floor. 4. Let kiddo have a say on bed and bedding. When it’s time to set the big kid bed train in full motion, make a big deal about going shopping for your child’s new bedding and let them pick it out. If you’re a stickler for how your kids’ room looks and don’t want a Thomas the Train comforter being the star of his bedroom, let your kid pick out the sheets (they’ll be hidden under your choice of comforter) or a small throw blanket emblazoned with his favorite superhero/Disney character/cartoon character. Letting your child pick out his or her own bedding will give them sense of ownership and pride in this exciting new journey! 5. Put the new bed where the crib went. Just like having a bedtime routine helps keep your kiddo feel safe and secure, so will placing the new bed where the crib once was. His or her bed may change, but at least the view from the bed will remain the same and give him/her a sense of consistency and familiarity. Also, you won’t have to move the video monitor (it’s the little things, really). 6. Don’t forget to baby proof. As much as your kid may practice sleeping on a big kid mattress before you put him in a raised bed, he/she will inevitably fall out of the bed at some point. To help minimize these occurrences (because there’s nothing more jarring for either of you to be woken from a dead sleep by a loud thud and sudden screaming), add some sort of safety measure to the sides of the bed. There are a great many styles of bed rails you can order on Amazon that work really well, but they can get pricey. My favorite hack for keeping my kids in their bed without using a child rail is to put a pool noodle under the sheet on the edges of the bed. Tape them down if you feel you need to, but I have found that, for the most part, they stay in place on their own. Having a pool noodle under the bedding will essentially create a bumper that prevents your kids from rolling off the bed surprisingly well. And they’re far less expensive than buying bed rails! 7. Don’t be afraid to start over. If you give the big kid bed a shot and it’s just not going well, don’t be afraid to put your child back in the crib for a few weeks and try again later. With my daughter, we were able to transition her from crib to bed effortlessly when she was about 18 months old. However, with my son, he had a hard time going from crib to toddler bed (just taking the front section of the crib off and adding the toddler rail). He would constantly get out of bed and lay by his door calling for me. It was frustrating and exhausting. After a couple of weeks, we decided to throw in the towel and put him back in his crib. I had a suspicion that the full railing of the crib gave my son a sense of security. Sure enough, as soon as that full rail was back on, he slept like a baby (no pun intended). We waited for another 6 months to try the big boy bed with him and, thankfully, he has done so much better. Sometimes, a child just isn’t ready for a big kid bed so you have to be flexible and try to work with your individual child’s needs. Transitioning from crib to bed should be an exciting time for parents and kids alike. Using these tips will hopefully help make your transition that much easier, but always remember to listen to your gut and your child’s specific needs to make sure you’re transitioning at the right time.